The sporting facilities are amazing, from world renown mountain biking, incredible road biking, swimming, tennis, golf, summer luge, horseriding, parapenting.... need we say more. The Alps has something to offer every age and interest, and is the ideal destination for individuals, couples, families and groups. Watch our short video to get a taste of a summer holiday in the alps. The Portes du Soleil is the spiritual home of European mountain biking and world famous for cross-country, freeride and downhill. Its interlinked lift system allows mountain bikers to cover an unimaginable variety of trails across all levels of riding, from steep and technical World-Cup level downhills to more gentle cross-country journeys. Overall, there are approximately 380 km of VTT sign posted paths, 24 lifts and 10 downhill tracks. The locals are passionate about their road cycling and Morzine is ‘base camp’ for some remarkable climbing in the local area. The road biking in the French Alps will undoubtedly give you a holiday to remember and lungs and thighs of the highest order. Whether you're a recreational cyclist looking for some breath-taking scenery or a racer looking to test your performance envelope at altitude, there are loads of fabulous routes to choose from. The Portes du Soleil and mountain ranges beyond offers infinite possibilities. These range from easy walks around the resort itself, more testing walks up towards the Swiss border, and the high glacier treks around Mont Blanc. Many of the lifts in the Portes du Soleil operate during the summer months to give you easy rapid access into the heart of the mountains. Morzine was one of the birth places of European paragliding and some of the finest pilots have come from the local area. The geology, geography and climate of the area offer spectacular flying. World cup events are often held here and every evening the sky is littered with kites playing in the valley winds. Tandem flights with an instructor are available and flights last approximately 20 minutes. There is an affiliated 'parapente' school in Morzine with full courses if you wish to learn to fly yourself. If you don't want to try it, just sit on a sunny pavement terrace and watch them fly over the chalet and land on the grassy slopes nearby. There are two courses nearby, an 18-hole golf course in Les Gets and a 9-hole course in Avoriaz. Les Gets is a magnificent par 70, 18-hole course set at 1,500m of altitude. Many rate this as the most scenic course they have ever played with lush green fairways and the glorious backdrop of a snow clad Mont Blanc. There are five other glorious courses within a 75 minutes drive. These are Annecy, Megève, Chamonix, Flaine and of course, the Royal Club at Evian, renown venue on the European Ladies Tour, overlooking Lake Geneva and one of the finest courses in France. Green fees vary from £20-£50, clubs can be hired and pros are available for coaching. Morzine boasts its own fabulous water park set in a sunny location with open air Olympic-sized swimming pool, children's pool, flume, volleyball court, lawns, children's games area, and restaurant with terrace. Backstroke under the surrounding mountain peaks never felt so good. For the more adventurous there is also a spectacular mountain lake ideal for swimming, as well as plunge pools and waterfalls to swim in and explore. Morzine has 10 all-weather tennis courts including two clay courts, as well as a tennis club serving drinks and snacks. An open tournament is held each week during the summer. The valley wind makes it feel like playing with your own personal air conditioning unit. Courts are available by the hour and rackets can be hired. Coaching is also available. Morzine has a purpose built summer luge with two lanes for a fast and ‘almost as fast' descent. You take the chairlift up and make the 900m descent on specially designed toboggans through jumps, twists and turns. Remember to use your brakes and if you’re going tandem don’t let the kids jam on the accelerator! Great fun for all the family! Gangways, bridges, ladders, tarzan swings… a safe way of being an adventurer and discovering the forest. High in the trees but perfectly safe, this airborne adventure designed for all ages is quite unique. Take on challenges to push your limits on Tarzan leaps, climbs, walkways, death slides and rope bridges. Between sky and ground, the park allows you to romp around for hours in total security. One of the best adventure parks in France. The Morzine Dérêches riding centre offers a large range of equestrian activities. Accompanied rides for all levels follow numerous trails through beautiful mountain scenery, making for truly memorable riding. For children and beginners from 5 years old, awareness / saddling sessions in the paddock are available. For the over 3s, the centre offers Pony rides along the forest paths. This impressive indoor rink is used for public skating and plays host to Morzine's national league ice hockey team. The beautiful River Dranse has its source just above Morzine and enters Lake Geneva at Thonon some 25 miles away. 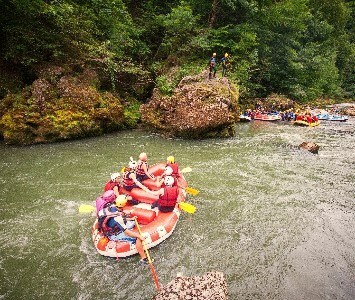 Certain sections of this river offer some of the best white water in the French Alps and host every possible combination of wet suit rubber and rapid; rafting, canoeing, hot dogging (inflatable kayak), hydrospeed (freefall swimming in armoured wetsuit, crash helmet, life jacket and flippers). Fantastic fun, totally exhilarating and very safe. Fully qualified local instructors provide safety and instruction of the highest standard. Abseil, wade, slide, scramble, swim and jump your way down a gorge and waterfalls using the mountain torrents from the Nyon massif as your path. Vertical drops are either jumped or abseiled. Nothing beats the exhilaration of abseiling down the middle of a waterfall or plunging into a rock pool. If you must, the Nyon Télépherique serves as a dramatic platform from which to jump head first into a steep dark mountain valley with consummate trust in an elastic cord tied around your ankles. This incredible adventure really does live up to the hype. Two zip wires, each over 1200m in length, fly you at breathtaking speeds of up to 100km/hour from one mountain peak to another. Only in France would this be allowed! An incredible sensation of flying and stomach churning G forces as you decelerate to land. An absolute must for adrenaline junkies. There is simply loads to do around the village to keep the littl’uns busy and engaged during the day. The village choo-choo train is a daily must and great way of getting around the village and down to the water park. Within steps of the chalet there are play grounds, trampolines, a roundabout and horse buggy rides. Those a little older will love the mini-golf, and a few years older the devil-karting, bungee swings, archery and skateboard park will fill every minute of the day. The restaurants and facilities all welcome children with open arms in the Summer. Morzine has a privileged location from which to explore the Haute-Savoie region of France and the Valais region of Switzerland. The French side of Lake Geneva, with its Mediterranean climate, beaches, and spa towns of Thonon and Evian is only a short drive away. The charming medieval walled town of Yvoire is a wonderful day out and best reached by the regular paddle steamer from the harbour in Thonon. Paddle steamers encircle and criss-cross the lake and are an ideal way to explore the Swiss Riviera and take in its clear waters and serene beauty. Our very own ‘Venice of the Alps’, Annecy, is about one and a half hours away with its beautiful lake and charismatic old town with lovely shops, cafés, canals and bridges. Alternatively, for a pure mountain experience, Chamonix-Mont Blanc is a little over one hour away. The world's highest cable car ride takes you to the top of the Aiguille du Midi from where you can enjoy spectacular views of Mont Blanc, but don’t forget your jumper! Also worth a ride is the funicular railway that takes you over an incredible glacier, the Mer de Glace (Sea of Ice). Closer to home is the ancient mountain goat village of Les Linderets, the old abbey ruins of St-Jean-d’Aulps, the well-preserved abbey at Abondance and the spectacular caves at Devil’s Bridge Gorge. Altitude Lodge is the perfect location to enjoy all the activities Les Gets has on offer. The geology, geography and climate of the area offer spectacular flying. Tandem flights with an instructor are available or you book a full course if you wish to learn to fly yourself. If you don't want to try it, just sit on our terrace and watch them fly over the chalet and land on the grassy slopes nearby. Les Gets boasts a fabulous 18-hole golf course - a magnificent par 70, 18-hole course set at 1,500m of altitude. Many rate this as the most scenic course they have ever played with lush green fairways and the glorious backdrop of a snow clad Mont Blanc. There are five other glorious courses within a 75 minutes’ drive. These are Annecy, Megève, Chamonix, Flaine and of course, the Royal Club at Evian, renown venue on the European Ladies Tour, overlooking Lake Geneva and one of the finest courses in France. Green fees vary from £20-£50, clubs can be hired and pros are available for coaching. The Ranch du Lac riding centre offers accompanied rides for all levels following numerous trails through beautiful mountain scenery, making for truly memorable riding. Morzine boasts a fabulous water park with open air Olympic-sized swimming pool, children's pool, flume, volleyball court, lawns, children's games area, and restaurant with terrace. Backstroke under the surrounding mountain peaks never felt so good. For the more adventurous there is also a spectacular mountain lake ideal for swimming, as well as plunge pools and waterfalls to swim in and explore. Alpe d'Huez offers a network of 9 ski lifts serving 140 miles of mountain bike trails. The lifts are open from early July to the end of August giving access to the 36 signposted routes. The mountains, rocks, high mountain pasture and forest provide routes for everybody from beginners to experts. As a winter and summer resort, Alpe d’Huez welcomes thousands of visitors all year long, who love the mountains and sports in general. The ultramodern Sports Centre offers a multitude of activities including; 3 indoor tennis courts, 4 squash courts, body-building room with cardio-training area, fitness room, dance room, climbing wall, indoor & outdoor pool, table tennis area, golf practice, outdoor archery, outdoor volleyball, outdoor basket-ball court, compact 9-hole golf, outdoor ice-rink, 13 outdoor tennis courts, badminton. Alpe d'Huez has a heated outdoor swimming pool open every day from 10:00am to 7:00pm (no admission after 7:30pm). Bathing suits required. Swim shorts are not permitted (bathing suits rental available). The indoor swimming pool is open every day, 11am to 8.00pm (except during swimming classes), closed on Saturdays. Swim shorts not permitted. For those inspired by Dancing on Ice - there is an olympic outdoor ice rink which is open from 10am to 1pm and 5pm to 10pm (except during events or training courses). Alpe d'Huez has a 9-hole golf course and practice area open daily from 9am to 7pm. An ideal place to start or to improve one’s game, it includes a 9-hole round, a practice range with 23 bays, a pro-shop, a training area with putting green, 2 bunkers and rough. There is also a 9-hole 'pitch and putt' course. Training courses and private lessons are available. Alpe d’Huez is an ideal starting point to discover exceptional panoramas, 12 lakes within walking distance, and prestigious peaks in the Massif des Grandes Rousses or in the Écrins National Park. The resort offers 250 miles of marked routes, including several easy routes for family walks. The network of lifts makes it possible to vary the walks and hiking circuits. Route guides are available from Tourist Information for a better introduction to the are, its wildlife, flora and forna. Alpe d’Huez features 150 climbing routes on the cliffs of Lac Besson (2200 metres), exposed to the west/south-west. These cliffs, which were first known for their ice falls form a great playground for beginners as well as experts. The fun sport of sledging (or ‘luge’) isn’t just confined to the snowy winter slopes. Alpe d'Huez has a summer toboggan run at the Piste de l'Eclose, which can be reached via the cablecar. Celebrating the summer solstice, this even takes places in cities, towns and villages all across France In Morzine, this free event spills out from the bars and restaurants onto the streets to celebrate every time of music imaginable. This 3 day event sets the start of the summer season, the Pass’Portes du soleil is a mountain bike ride ranging from 1000 to 2250m in altitude covering both the French and Swiss sides of the Portes du Soleil. Conquer this 6km race with approximately 20 obstacles. The course will take you across gaps, obstacles and irregular terrain with potentially hidden natural obstacles such as water and slippery surfaces. Morzine Harley Days is back in Morzine - the Harley-Davidson Owners Group (HOG) descends on Morzine for a long weekend. Don't miss the opportunity to drool over these beautiful machines as approximately 3000 bikes arrive for the weekend. From 16 – 20 July, there will be special workshops, games, sports, free shows and more especially for kids! Dedicated to your wellbeing, enjoy a week of yoga workshops, Pilates, Nordic walking and more. The tourist office square will be transformed into a sandy ‘beach’ with inflatables, deckchairs, games and lookout tower. The Trail des Hauts Forts are all natural trail runners races with a short (25km race), a long (45km race) and a 10km race. The route takes you through three mountain passes around the Hauts-Forts peaks and through some of the most beautiful landscapes in the Portes du Soleil area. 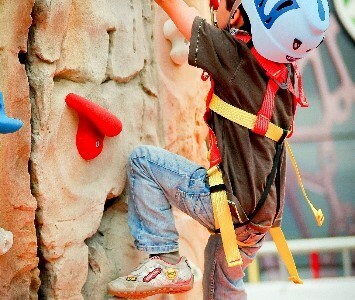 From 11 – 17 August, there will be special workshops, games, sports, free shows and more especially for kids! At the end of the summer season for the last 20 years, Morzine has hosted a key stage in the French Automobile Championships: the Mont Blanc Rally. For petrol heads in the Alps the Mont Blanc Rally is one of the big events of the summer. A world-class field will contest this mountain biking competition, complete with a brand new cross country course to tackle. In memory of the storming of the Bastille in 1789, celebrations are held across the whole of France to mark this occasion. This event presents mechanical music in a different light - this year with the theme "The Five Senses". Enjoy two full days of non-stop performances and activities. Remember that ‘taste’ is one of the 5 senses – local restaurants will also host artistic and gastronomic performances. Test your golfing prowess over the scenic Les Gets golf course in this fun competition. Slow down with this long weekend which focuses on wellness and connection with nature. There's the chance to try yoga, meditation, dance, pilates and qigong, with many classes take place outdoors. A relaxed acoustic music festival with free concerts in various venues around Les Gets. Contest a stableford gold tournament over Les Gets' scenic 18-hole course in the morning, then finish the afternoon with a poker tournament with a twist - your chip allocation is decided by your golf score. This trail running race will see 1200 participants tackle three different courses with stunning views over the Mont Blanc mountain range. Spectators can watch the start, finish and medal ceremonies in front of the town hall. Celebrating the summer solstice, this even takes places in cities, towns and villages all across France In Alpe d'Huez, this free event spills out from the bars and restaurants onto the streets to celebrate every time of music imaginable. 7000 cyclists every year attempt the race that would send even the most up to date altimeters round the bend! The ascents up mythical cols and the final ascent up the world famous 21 bends to Alpe d’Huez make La Marmotte one of the most reputed sports cycling events in the world. Starting at 3330m high, Megavalanche is one of the most famous downhill races. Finishing in Allemeont at 2600m, it's the longest and craziest race in the world. The aim of the Haute Route is to deliver an unparalleled professional experience both on and off the bike for amateur riders. Join amateur riders from across the globe to live like professionals for three days on one of the most iconic cols in cycling. The annual duathlon and triathlon contest puts competitors through their paces as they push themselves to the limits across the varied and high-altitude terrain of Alpe d'Huez. There are 5 events, held over the week, offering many different races for varying abilities - there is even a kids mini-triathlon! Races take part between the two neighbouring resorts of Alpe d'Huez and Vaujany. In summer we open 9 chalets in Morzine, one in Les Gets and 7 chalets in Alpe d’Huez. We have selected these three resorts as they offer the perfect location for a summer holiday in the mountains, and the chalets will provide a perfect retreat for families, groups or couples looking for a short break or a week away.